According to EarthSky, the annual Ursid meteor shower always peaks near the time of the December solstice, so, in 2016, look for some possible activity over the next several nights. The forecast calls for December 21-22 to be the peak night. Normally a sparse shower, you might see about five meteors per hour. This shower favors the more northerly latitudes in the Northern Hemisphere. All meteors in annual showers have radiant points on our sky’s dome, and the showers take their names from the constellations in which the radiant points lie. The Little Dipper asterism is in the constellation Ursa Minor the Lesser Bear. Hence, the Ursid meteor shower. 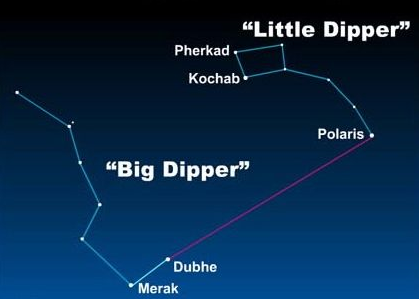 The chart at the top of the page shows the Big and Little Dippers around 1 a.m. when the Big Dipper is well up in the north-northeast. If you trace the paths of the rather slow-moving Ursid meteors backward, they appear to come from the section of sky marked by the Little Dipper star Kochab. See sky chart below. Although the Little Dipper is circumpolar (out all night) at northerly latitudes, the star Kochab sits below Polaris, the North Star, at nightfall. Kochab (and all the Little Dipper stars) circle Polaris in a counterclockwise direction throughout the night, with this star reaching its high point for the night just before dawn. The higher the radiant climbs in your sky, the more meteors that you’re likely to see. Read the rest of the article at EarthSky.